nstructing the internal studding walls, upstairs and on the ground floor. 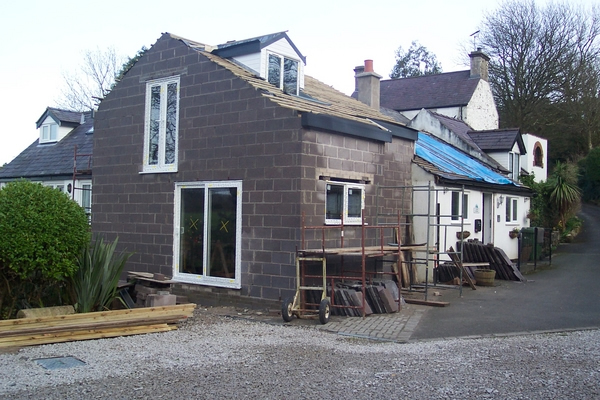 White plastic cladding was applied to one of the gables and then black facias were attached . Last week we took delivery of the PVC windows and door fitments, they have now been installed. Keith and Neil then moved into the kitchen area and screwed the units to the back wall, finding three doors over and two drawer fronts the wrong colour. After contacting Huws Gray to locate the worktops, sink top and door handles, it was found that they had been lost, so they have to be re-ordered. Work in the kitchen area was then abandoned. Keith finished creating the new chimney, rendered it and then fitted the chimney pot. Inside the woodburning stove was put in place. Decisions were made where the lighting, sockets, switches and smoke detectors were to be fitted. The shower room is to have a shower cubical with power shower, threequarter pedestal sink and close coupled wc. Three staicase manufactors were contacted and they proveided quotes for the new staircase,. One has now been accepted and the staircase in now on order, it should be here within a fortnight. The underfloor heating for the new building is due to be delivered in the next few day, but we need to have had the internal walls plastered before the pipe work can be layed. On Monday 30.01 the electrician and the plumber came on the site and worked alongside Keith and Neil, who were putting in the Insulation. Hugh started up stairs, in the Master bed room and started to put in all the wiring for the lights and sockets. While Mike, the plumber, worked in the shower room fitting in the hot and cold feeds and some copper piping for the radiators. It was a very productive day.